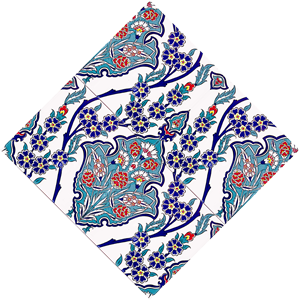 Turkish tiles is the oldest technique widely used in the art of glazed brick decoration can be said that the source of this technique. Mosaic tile art of the 13th century Anatolian Seljuk winning personality to tile art and tile technique continues until the end of the 15th century the existence of the Ottoman empire. The main technical feature of ornament, decoration is done eg by direct zinc opaque colored glaze. In this technique, the painting comes with colored glaze on the plate, drawn again with a chromium oxide to decorate for example on the plate in the colored glaze technique composition, given the contours so that baked colors. 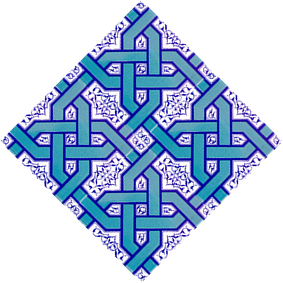 13th century in Anatolia Seljuk As used, completing the second half of the 16th century a tile technic. This is a glaze techniques. Transparent colorless glaze with white slip decoration on plates of gold and silver powders are made and baked. 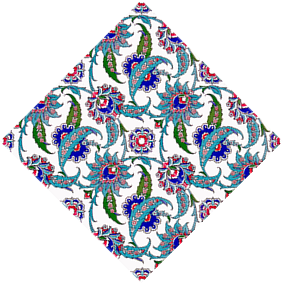 “The first Ottoman Period” called the period tiles, Iznik Green Mosque minaret (1390), Bursa Green Mosque and Tomb in (1421), Bursa Muradiye Mosque in (1426), Edirne Muradiye Mosque in (1433), Istanbul Mahmut Pasha Tomb (1463) Tiled Kiosk ‘in (1472), and is seen in Shah Melek Pasha Mosque in Edirne. These are usually made with mosaic tiles and painted technique. 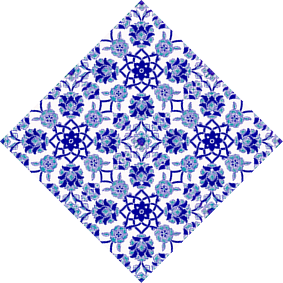 During these periods, navy, blue, turquoise, black, and yellow colors and arabesques, kufic script, geometric shapes and stylized motifs of vegetable origin we used.in this periods, can be called a transition period. Nakkaşbaşı Age of Fatih Nakkas father, played a major role in the development of the use of ceramics. Yavuz Sultan Selim time expanding the boundaries of the state of the artists brought to Istanbul from other regions has also provided significant contributions to the arts. 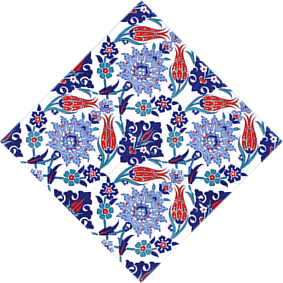 Yavuz Sultan Selim Mosque and Tomb in Istanbul (1522), Prince’s Tomb (1525), Hasseki Madrasah (1539), Prince Mehmet Tomb (1543) Topkapi ‘Kara Ahmet Pasha Mosque (1551), the tiles used in architectural monuments such as the period the works. 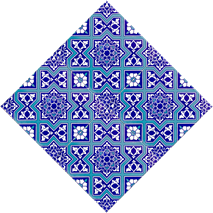 These tiles produced with painted samples; Rumi, clouds, fault-style motifs of vegetable origin, pistachio green, yellow, blue, turquoise, navy blue and brick colors are used. Yellow, gold foil glued onto the liner to have been changes and improvements in both the quality and production patterns in both periods was thought. 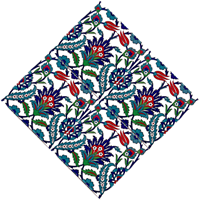 Turks, abandoned their mosaics and dry edge techniques, secrets developed the six paint and glaze techniques. 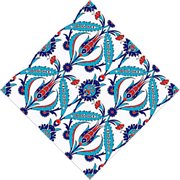 In addition to this new pattern began to be developed and produced nakışhane palace. Before Iran ‘s, which is a painter and he said Sahkulu Parents Can Başnakkaşlıg brought to the palace and began to produce patterns Reed Road. Phoenix birds, along with large leaves, pigeons and parrots, deer and rabbits, roosters, etc. animal motifs began using the tiles. Demi Karamea student and palaces nakkaşbaş followed him, cypress and spring trees, vines, tulips, roses, hyacinths, Manisa tulips, iris flowers, centaury flower, lily, narcissus flower, carnation and their buds ornament very little has begun to use by simplifying and started to be used again, red, leaf green, blue, indigo, turquoise and wood has been a spring cycle in china with Brown for their bodies. “Classical Period” called this period, Ibrahim Pasha Mosque of the Silivrikapi (1551) begins with the construction. 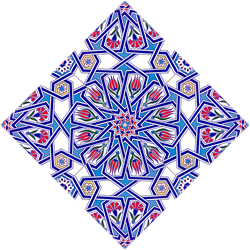 Another important reason for this development is that the period of Mimar Sinan and tile work is that many of the greatest importance that he did. 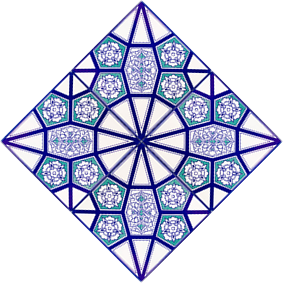 In fact, it sort of works the period also shows the degree of its importance. Süleymaniye (1560), Blue from Sokullu Mehmet Pasha (1571), Kasımpaşa Piyale Pasha (1573), Eminönü Rüstempaşa (1560) mosques, Topkapi Palace in Altınyol boards, ııı.murat Pavilion II. Selim III. Murat Tombs, Tophane Kılıçali Pasha (1580), Üsküdar Toptaş the Old Mother (1583), Fatih, Wednesday and circa Mehmet Aga, Ramadan Lord, Edirne Selimiye Mosque and skullcap Topkapi in Istanbul Ibrahim Agha and Legal wife Hürrem made monumental tombs are decorated with tiles of the selection period. Sultan Ahmed Mosque (1616), the Topkapi Palace in Baghdad and Revan Pavilions, Üsküdar Tiled Mosque, Eminönü Hatice Turhan Sultan Tomb (1682), New Mosque still Eminönü (1663) made during this period and are the main structure adorned with tiles.